Roses are an ideal gift for special times. Roses are known as the "queen of flowers". A long-stemmed rose not only looks elegant but also gives a fine, sweet scent. No wonder roses are commonly associated with love and beauty! Roses come in lots of varieties and colors. Besides the wild and old varieties, hybrid rose flowers are also being grown nowadays. Although they stay fresh longer and are not so delicate, the hybrid roses do not have much of an aroma. Roses can be given on lots of occasions to express your feelings. You can send them for an anniversary, birthday, get-well-soon message, news of a baby, sympathy, thank you, Christmas, Valentine's Day, Mother's Day or because there is love and romance in the air! Of course, the most popular day for sending roses is Valentine's Day with a heartfelt message. When sending roses to anyone, you should be aware of what colors the roses signify. Red indicates love and respect. Yellow roses communicate joy and friendship, while light pink roses say that you are sympathetic or admiring. If you want to show appreciation or gratitude, do it with pink roses. Orange roses convey desire and enthusiasm, while white roses imply innocence and purity. Yellow roses with red edges are a sign that you are falling in love! Red and white roses in a bunch have been used by the Greeks at funerals, and denote bad luck for them. But, they also mean unity for some people. Wiring two roses together to create a single stem is a sign of engagement. Just sending rosebuds indicates beauty, youth, and innocence. A single rose is a symbol of simplicity. 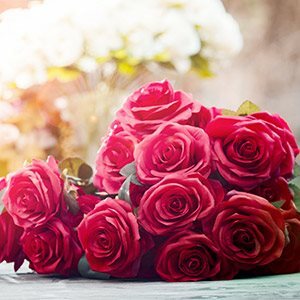 At LolaFlora, we ensure that we offer you the best and fresh roses and they will be delivered in time. Select your roses thoughtfully, and turn the event into a memorable one. Red rose bouquets not only bring joy, but also alleviate pain. Sending one to a friend who has just been through a painful break-up, or a parent who is unwell, or a sibling who has not been able to manage good grades can work like a healing touch. It makes loved ones feel that there is someone to share their pain with and they are not alone in their sadness. This healing touch is particularly helpful when the sender is unable to be present physically because of work constraints, or some other unavoidable limitations. 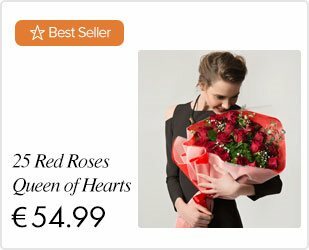 Red rose bouquets also help when an important date needs to be canceled at the last minute because of some other exigency and the sender wants to communicate genuine regret at not being able to make it. Similarly, the red rose bouquet helps senders apologize for forgetting anniversaries and birthdays without meaning to. The red rose bouquet always says much more than words. These beautiful romantic flowers make the ideal bridal bouquet. Pair white roses with white carnations to make a more affordable floral presentation. If you want a splash of color, consider white roses and purple orchids for a luxurious wedding bouquet. Flowers have always been termed as a symbol of love and attachment. They are given as a present to show that you care for the person receiving them. It is due to their delicate nature, ecstatic smell and exuberant colors that people get attracted towards them instantly, that's why flowers are considered as the gifts of love and spring. If you are a shy person and you find it difficult to express your feelings towards someone, you can choose flowers to do the trick. Guys usually find it difficult to express their love and on the other hand, girls love flowers. So, if you want to express your love, give her some romantic flowers to tell her what you feel about her. You can give her an individual flower like a red rose or a mixed rose bouquet with an assortment of colors. If you are on a tight budget, you can make a bouquet which includes a few roses and cheaper flowers such as carnations or gerberas. Buy gerberas online in vivid colors like bright orange, hot pink or sky blue. Try to present your bouquet in a nice way, for instance, accompanying a message card. The way will surely communicate your feelings romantically. She might also appreciate more a cheap potted flower that she can replant such as a desert rose or yellow submarine roses. 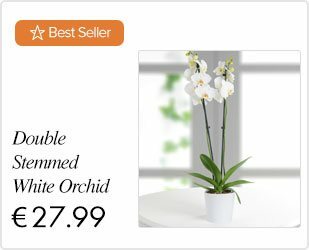 At LolaFlora, we offer only the best flowers for sale and we do not compromise on quality. A trial would convince you!